Combination of pure Canadian Maple syrup and kiln roasted malt. Originally rated December 2004. Poured a beautiful amber colour with a foamy white head and slight lace. Aromas were sweet and malty. The taste was nutty with medium sweetness and mild sourness. Good drinkability, but not much maple in the taste, just in the nose. The maple shows up when the beer warms up a bit, so don’t drink too cold. Pours a golden brown color with a nice foamy head and quite a bit of lacing on the glass. The overall look was quite appealing. The Maple syrup effect was noticed in the aroma along with some malts. I think it tastes a little more like a Lager than a Brown Ale personally. Maybe a comination of the two because this did have a hint of spice and sour in there and certainly more flavor than a "typical" lager. Maple? Where is the maple? Another poor wattery thin offering from Upper Canada. I wish i was able to try their beers before Sleeman’s got their hands on them. A dilute light-bodied ale with little richness of malt or the promised maple flavoring. A quaffer. Too much fizz. Pretty watery, thin tasting beer. A little sour, and not very maple-y. Pretty disappointing beer. Bottle (341ml). At Smokeless Joe. Brown Ale - that’s HI-larious - it’s pretty pale lager-y. Poured a clear bubbly refractive amber with a minimal head. Aroma? Frankly, I didn’t really get any, no matter how hard I tried - I could smell the brine from the oysters halfway down the bar - okay, faint grain and some sugary malt. Flavour of stale light roast malt, a hint of maple flavouring, stale hops leading to a surprisingly bitter finsh, but not really in a good way. Mouthfeel lightly fizzy, watery and thinly syrupy. Overall, not much of anything - no adjuncts, but boring and not very much maple - and not very BROWN either. 341mL bottle. Nice looking amber beer with a small foamy off-white head. Aroma is malt with maple notes if you really sniff hard. Tastes like your usual macro-style brown ale, but is lacking in body. Finish is a bit sweet, but not in a maplley way. 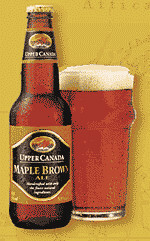 I’d like to try brewing my own maple brown someday soon. It is simple not mapely enough to be ’maple’, got strong hints of alcohol from this? Nice and frothy the lacing held up well. Not bad. A sweet malty beer but I can’t really pull the maple flavour from this. That would be an interesting beer in premise, but it doesn’t come close to its description.